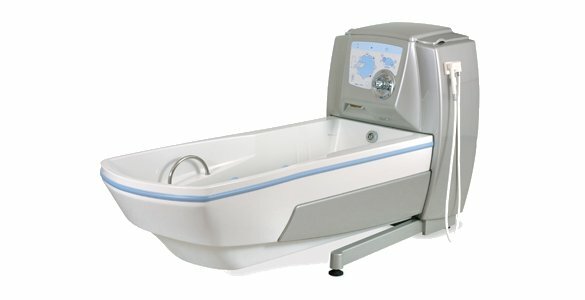 The Magic line of variable height baths represents state of the art technology in bathing suitable for use in hospitals, private clinics and nursing homes with a requirement for acute care. All models are manufactured with a hygienic and easy clean finish. They are fitted with an integral battery back-up system as standard which ensures that in the event of a mains power failure, the bath can be lowered to allow the bather to be safely removed from the water. A removable foam headrest cushion and removable footrest are also supplied as standard. Automatic water shut off saves carers time whilst filling the bath. The Magic 2000 has 3 bath fill level options and enables the water temperature to be preset; once the level has been reached the water flow stops automatically. This is a particularly cost effective function where bathing systems are used frequently. The baths are designed to work in conjunction with the GK range of bath lifters, namely the Hektor and the Ikarus which eliminate the need for manual transfers. Our range of Human Care overhead systems such as the Niklas Gantry fixed ceiling tracks; Satelite, Roomer, Single and Herkules are also suitable.